Crossfit is literally taking over the world.. Ok so maybe that’s a little exaggeration but seriously crossfit gyms are EVERYWHERE. 6 months ago most of the fitness world probably thought this was just going to be another ‘fitness fad’, kind of like Zumba the ‘calorie burning dance fitness party’ that would trim and tone your buttocks; or my personal favourite the ‘power bracelet’ that promised improved athletic performance and endurance. Crossfit, despite its fair share of negative press seems to be ever growing in popularity. Crossfit is a form of strength and conditioning that utilises functional movements and Olympic style lifts performed at high intensity. Let’s get up to speed with some of the lingo…. The gym or ‘box’ is usually a fairly open warehouse like space filled with pull up bars, squat racks, barbells and kettlebells; no treadmills or weights machines. The ‘wall’ is where the WOD (workout of the day) is written. Each day is different with each WOD being a unique combination of exercises that may see you competing against the clock or working through specific reps and sets. The demands of a crossfit workout are quite unique in that many of these ‘functional movements’ require unrestricted full range of movement; at multiple joints with perfect technique in order to prevent strain and injury. While many people may be under the impression that crossfit has a greater tendency to harm than other forms of exercise we must consider that all high intensity sports from rugby to running are prone to both traumatic acute injuries and overuse injuries. The aspect that sets crossfit aside from several other sports is the high number of repetitions required with each exercise; more often than not the injuries that we see sustained while participating in this ‘extreme sport’ occur under fatigue. Even the fittest, most conditioned of individuals can’t perform heavy Olympic lifting style manoeuvres with perfect technique 100% of the time, so what chance does this give the amateur participant? Or what about the participants carrying a pre-existing injury? Now common sense goes a long way in a sport like this, and many say well if you can’t handle it then back off in intensity, lift less weight so you can focus on technique. That’s a bit of a hard sell to many cross fitters when workouts are often treated as a competition. 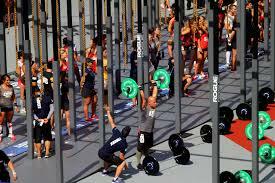 The birth of crossfit ‘games’ probably adds a little more fuel to this fire. Working within your body’s limits isn’t always at the forefront of your mind when you’re in a race to beat the guy next to you; more so if you are anything like me and thrive on a little competition that little niggle in your back may not be enough of a nuisance to make you stop until its too late. At the end of the day I firmly believe the concept behind crossfit is great and most Physios, trainers, physical therapists and the like would agree that functional movement based exercise is far more beneficial for our bodies than isolated exercise techniques. When done correctly it can foster the development of proper movement patterns, improves musculoskeletal co-ordination and muscle synergy; but when done poorly you are potentially leaving yourself open to injury. We shouldn’t be using complex exercises to gain fitness without first mastering the basics! Some injuries can be prevented BUT there is no 100% foolproof program that will guarantee your health and safety. If you’re thinking of giving it a go be sure to keep a few things of these things in mind when you do. Control your competitive streak; winning is always fun, but don’t compromise your health just to get your name up in lights. If it hurts do something about it.